Because we love Ignis Pixel Poi they are now available to purchase from the Home of Poi website. We believe they represent the best of available Pixel Poi on the market. The images you can create are truly amazing. Upload any kind of photo and pictures and once the LED Pixel Poi are spun your image will appear in the Air. New tiny LEDs show perfect colors with improved yellow and orange tones that makes pictures on your poi sharper, more realistic and colorful. Great money-making tool both for professionals and amateurs. Upload any graphics you need, adjust up to 10 timelines to synchronize your performance scenario with music. We guarantee that Ignis Pixel Poi will amaze your audience and help you to earn more on your LED shows. Otherwise just return your Pixel Poi within 30 days in new condition and get a refund. We give 100% money-back warranty within 30 days of purchase (on receiving parcel). If you are not satisfied by our props you can return it within a month. Props should be in new condition (full set, no traces of usage, no scuffs). In case of such return delivery costs are assigned to the Buyer. If you receive defective props or there was mistake in model or quantity we would send free replacement and compensate your postage expenses for sending incorrect or defective item back to them. We give 2-year warranty for our products. It means that if during warranty period you find a production defect we will repair or replace defective item for free. All delivery costs are on Buyer. 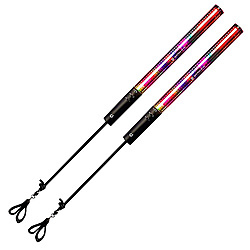 Ignis Pixel Poi are impact-resistant but not indestructible. Very hard bumps can cause malfunction of pixel props. This is why warranty doesn’t cover malfunctions due to hard impacts. But in this case we do offer a repair service. Repairs usually costs less than USD $100. If products that you ordered are in stock usually they send them within 1-2 working days after payment. If something in your order is not in stock then we contact you and provide information when it can be shipped. That is why you should keep in touch with us after you have made order. Ignis produces the Pixel Poi according to their concept of high reliability, maximum comfort and high quality. Appearance and functionality of their products may differ in small details from information and photos on our Website. This is due to the fact that they are continuously developing and improving products and do not always have ability to update the photos and information. У нас нет отзывов для этой категории. Вот некоторые обзоры обслуживания и поддержки наших клиентов.